Calculate CNC milling and drilling paths based on 2D contours and geometries with the module 2D / 2.5D Milling of vectorcam in a fast and uncomplicated way. The integrated CAD system enables fast and easy dconstruction of these geometries. Of course, the geometric data can also be imported directly into vectorcam via the integrated CAD interfaces (DXF, STEP, IGES etc.). For programming the different geometries, vectorcam provides numerous machining strategies in the module 2D / 2.5D milling. Our experienced technicians are at your disposal for advice. The dropping strategy (vertical, ramp, helix) as well as tangential approach and exit instructions etc. are determined by the user according to his specific requirements. The machining of contours, for example consisting of lines, circles and / or curves (splines), etc., takes place with the function "Milling contours". The consideration of the Z-position of the contours happens automatically. All Z-motions of the tool are related to the local coordinate system and the Z-position of the selected contour (s). Machining takes place: with / without cutter radius compensation, Z start-up instructions, one or more infeeds, tangential contour start and stop with / without allowance, etc. Any 2D-forms or fonts can be engraved. Complex files or shapes with hundreds or thousands of features can be reorganized using special features. The reorganization calculates optimal and short approach or tool paths. In addition, contiguous contour elements are automatically linked with each other in order to generate as few approach paths as possible. The function "Chamfering / Deburring" automatically determines the tool path for deburring based on the selected contour and the selected tool (chamfer milling cutter, burin, etc.). Finally, the user determines the tangential start-up instructions and depth cuts according to his wishes. Any contour shapes can be removed as a pocket. Pocket contours can be arbitrarily complex. Pocket areas that are not accessible with the specified tool will be skipped automatically. The function “rest material” identifies and cuts those areas automatically with a smaller tool. The user can choose between contour-parallel and X-parallel toolpaths. Rest material, which is generated by using too large tools within pocket milling, can be identified and removed by a smaller tool. Naturally the machining only occurs in the area of the rest material, whereat the tool within the pocket always automatically moves from the outside towards the rest material. Any profiles can be edited with a ball end mill within the function “profile contour”. Undercuts will be eliminated automatically. Standard profile shapes are a linear wall at an angle or an S-profile. Any other profile shapes the user simply draws in the CAD part of vectorcam. All toolpaths are Z-constant. The tool offset is calculated three-dimensionally. The parameter “max. scallop high“ provides a clean surface. Here the user specifies the desired surface quality. vectorcam then calculates the necessary page steps for the specified tool automatically. The 3D removal simulation graphically displays the CNC machining of the workpiece with the defined tools. For the different views, the user has a variety of different options to choose from. The complete kinematic motion sequences of the CNC machine (including workpiec, stock, clamping, etc.) can be displayed and simulated. Download a free trial version. 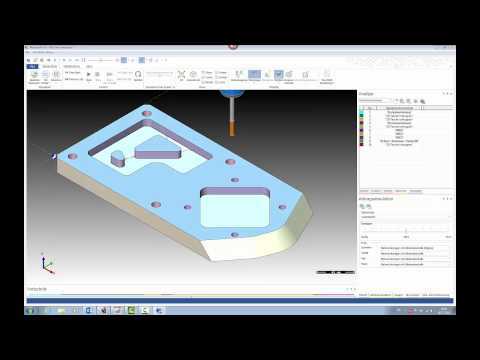 Tips and tricks for 2D milling are available in this vectorcam video tutorial. Get to know the milling of pockets, chamfers and outlines using a 2D drawing.